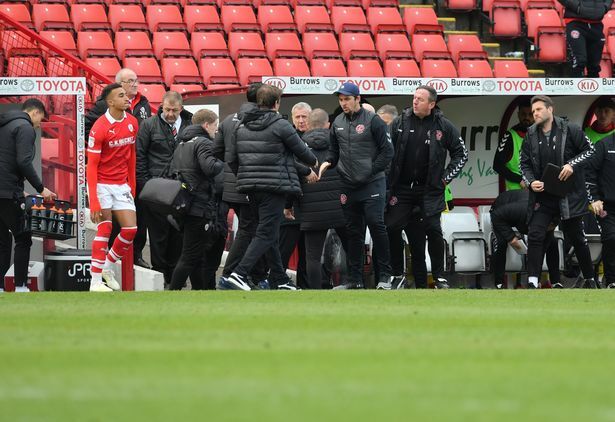 Fleetwood Town manager, Joey Barton is said to have gone up against Reds manager Daniel Stendel in the tunnel following Saturday’s game, which ended in a 4-2 triumph for the home side at Oakwell, and South Yorkshire Police are investigating. It is understood Barton and Stendel had to be separated after the full-time whistle but the former Manchester City player reportedly followed his opposite number towards the dressing rooms. Barnsley striker Cauley Woodrow tweeted that Barton went up against Stendel following the amusement, which ended in a 4-2 triumph for the home side. According to The Sun, Barton headbutted and punched Stendel before grabbing him by the throat. Stendel reportedly lost two teeth in the assault. Police are still investigating the incident in the tunnel including the disputable and controversial Fleetwood boss. Tykes forward Cauley Woodrow took to Twitter to describe the incident, claimed Stendel was left with “blood pouring from his face“. The post has since been deleted. Neither one of the clubs addressed the media for their post-match duties after the match, which saw Fleetwood have Harry Souttar sent off following 65 minutes with Barnsley leading 2-1. Barnsley said in an official statement: “The club can confirm there was an alleged incident in the tunnel area that took place following the conclusion of today’s match, which South Yorkshire police are currently investigating. Harvey disclosed to BBC Radio 5 Live’s Sportsweek program: As an off-the-field matter the tunnel is still in the domain of the referee but we will work closely with everybody to ensure it’s not a case of who deals with the matter but actually the matter is dealt with properly.